Order in the next 3 hours, 19 minutes an 3 seconds for same day shipping. Perfect for stamping your cheques!. The maximum size of the impression is 68 x 9 mm, which offers plenty of width for your IBAN and/or account number or cheque PAYEE name. This small, versatile stamp is commonly used by small businesses or at home, but also widely liked for office applications. Practical idea: Add your business name and account no, on the self-inking stamp - let your customers save plenty of time, when making your cheques out in store to pay you for their goods. Trodat Printy 4916 is produced climate-neutral with maximum possible use of recycled plastic and compensation of unavoidable CO2 footprint by investment in climate protection projects. Suitable replacement pads 6/4916 are available in black, blue, red, green or violet. Dry felt pads are suitable for special inks. Replacement pads are supplied in multiple packs of two. 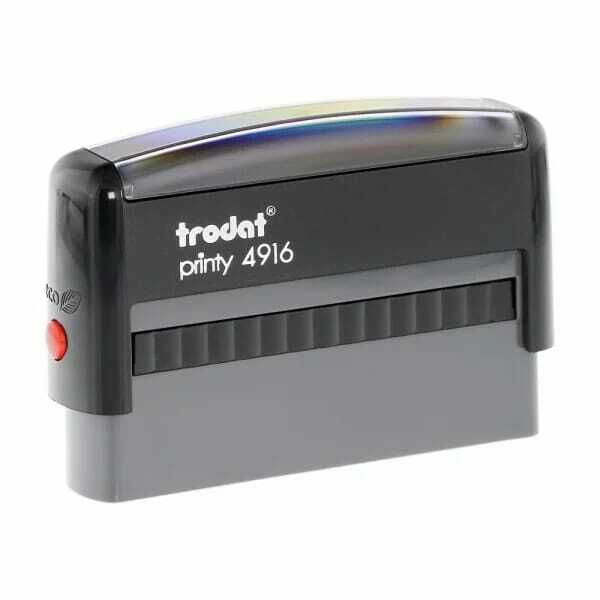 Customer evaluation for "Trodat Printy 4916 70 x 10 mm - 1 or 2 lines"